Hope all of you are still out there and reading my ramblings. First up, with the WordPress 4.3 update I lost my last post and all your lovely comments. So sorry about that. Also you may be wondering why I haven’t commented on the recent news in my life yet. Basically, I’m building up to it! It’s a little overwhelming to put into words exactly how it’s changed everything. One thing I will hold my hands up to is that it’s now almost impossible for me to comment on blog posts. I honestly cannot find the time. Even time for reading blogs has been squeezed. That really upsets me because I always felt like I was part of a conversation in this community of sewists. Instead I have to rely on twitter and IG where I can comment all at once. Maybe you hadn’t even noticed the difference but I’ve absolutely missed it. So now I’ve bummed everyone out… I have another unblogged make to share with you all. 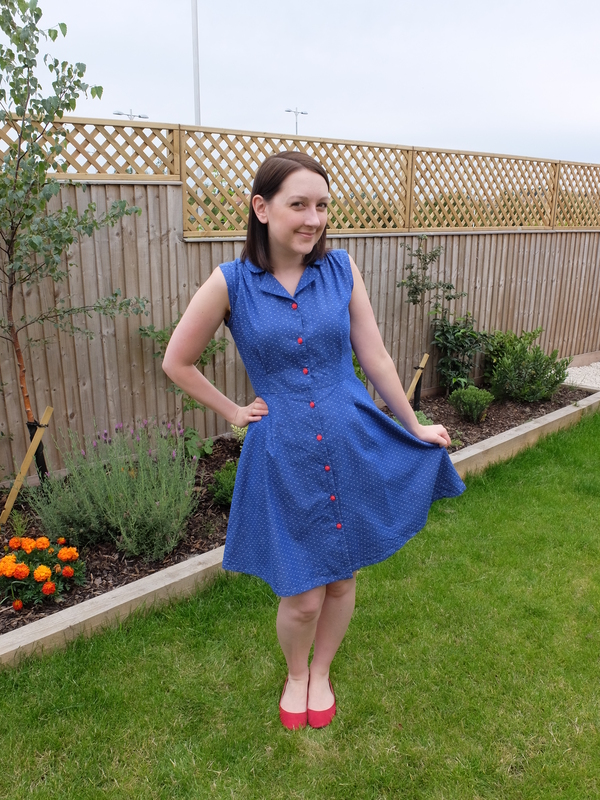 Here is my first Sew Over It Vintage Shirtdress. I’ve already made a second! I saw Emmie’s tester version at the Fashion on the Ration exhibition and wanted to rip it off her hahaha. Instead I bought it the day it came out. I was in such a rush I didn’t even see there was a pattern discount to apply – doh. This is my favourite of all the SOI envelope illustrations. So where to start. Probably sizing because it’s important. I made a size 8 and it fits me almost perfectly which is insane!!! I made a size 10 muslin fully expecting it to fit me around the bust but need letting out at the waist, shortening in the torso and a narrow shoulder adjustment. But it was almost right which is absolutely bonkers. I’ve got a 35″ bust, a (EDIT! I mistyped my waist measurement by 4 inches on my first post. Sorry!) 34″ waist and I’m 5ft5. There’s no need to give my hip measurement as it’s safe to say the quarter circle skirt skims over everything and is really flattering on a pear shape. It’s JUST long enough so ladies taller than me, take note. The release pleats are a nice change from darts. For reference I normally make a size 12-14 in Big 4 patterns and a 10/12 in BHL and 36 in Deer and Doe. I actually used the sleeved cutting lines but then left off my sleeves at the last minute. I think the armholes sit well but the gathers seem a little distorted. I saw a recent pic of Lisa in a blue polka dot sleeved version and it made me a little sad I’d left them off mine but nevermind. The collar is constructed slightly differently to a regular notched collar as the two pieces of the collar stay separate. I’m comparing this collar to my satin pjs and my Simplicity 1880 shirtdresses. This actually makes it much easier to manipulate and achieve a clean finish. 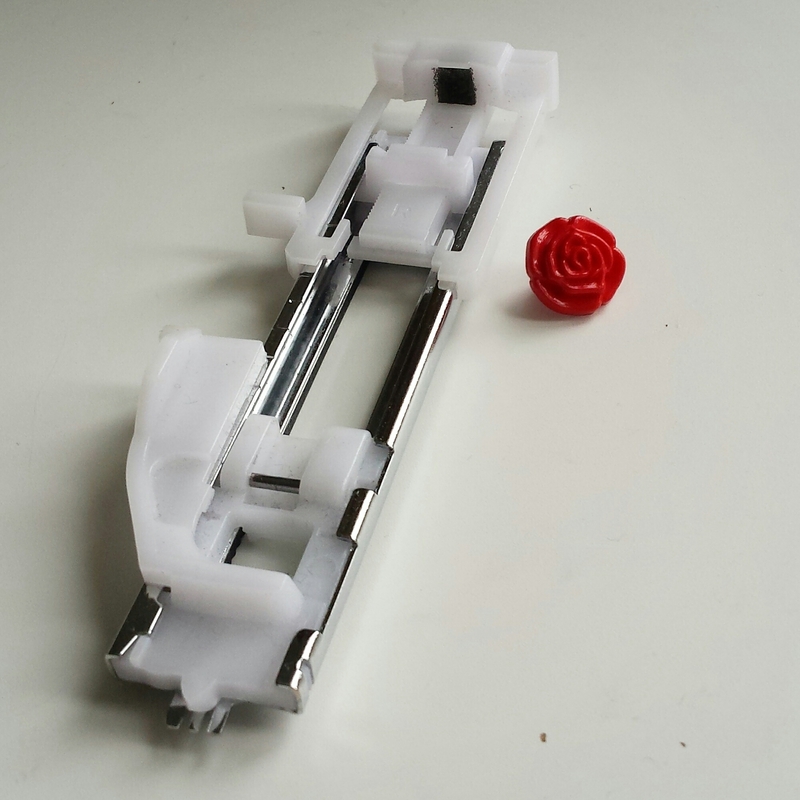 Clever thinking for making this easier for new sewists and a new twist on the style. The fabric is a dotty chambray I picked up in the M is for Make sale a few months back. It’s a Robert Kaufman chambray in Royal with white woven dots. I loved the drape and feel so much I recently bought the black colourway from Village Haberdashery! The dots are woven and slightly raised rather than bleached or printed. It’s finished off with little red rose buttons from Ribbon Circus in Hebden Bridge. After a bit of headscratching I managed to get them to fit in my automatic buttonhole foot. If I’d had to do a 4 step for this button I’d have been pretty scared of nailing the sizing! I used navy bias tape and overlocking to finish everything inside. I wanted to finish the hem with bias too but it made it too stiff. So there you have it! I wear this dress a lot and when I pair it with my red cardigan and shoes I feel like a 1970s schoolteacher or with my navy cardigan it more Matron at a 1950s hospital. Can’t really explain why hahah. Last week, I had a few days off to sew as I want to make a proper dent in my fabric stash. Now I have four or five dresses, three tops and a pair of jeans to share at some point! I also want to talk about my new job and some of the things I’ve sewn for that! Am I the only one with a blogging backlog? I bet you’re all more organised than me! Your dress is gorgeous! And I LOVE the change in love sewing magazine since you’ve become editor, its like having a magazine based on all the blogs I follow! Perfect! This is super cute and perfect for summer work days! And those buttons? Squee! Thank you! Sadly our summer days are almost over but aaah we had some good ones!! Thank you! It’s super comfy to wear too. The chambray is highly recommended from me! I bought this pattern in the summer but didn’t get around to making it. I love your version and those buttons finish it off great..!! Thank you! I definitely recommend making it for autumn as with the sleeves it won’t get too cold. Aww feel for you that you’re now too busy for commenting on or reading blogs. I too would really miss it. It looks very lovely. I’m a big fan of dotty/spotted fabric, and chambray. I have a huge blogging backlog but hoping to have them all churned out soon. Thank you! It’s so hard as everyone is making lovely things and I want to comment so badly! No train signal, a 2hr commute, longer work hrs and early to bed – all these things are conspiring to ruin my blog commenting! Your dress is gorgeous!! I absolutely LOVE the buttons! Heehee thank you! I love them too. So much I bought a set in black too!! Thank you! It’s not quite a second neckline, just more modest button placement heehee! Notch collars are a bit forgiving with where you want them to end. THANK YOU! – for telling us your actual measurements, in relation to the pattern size you cut out. That was very, very useful. (I assumed your 38″ waist really meant 28″?!) There is so much varition in pattern ‘ease’ that sometimes it’s just a little daunting when you embark on a new pattern. No problem. When it’s that much of a contrast in sizing I think it’s important to share – even if my measurements aren’t that impressive. And you’re right that I made a typo but sadly my waist is 34″ at the moment… it was that birthday cake! love it! this is one of my fave patterns of this year – i had to do serious lengthening though and i think i’d do more for the next version! but i’m pretty sure you don’t have 35″ waist! Ooh yes I bet you lengthened it quite a bit cos I was staggered to make no shortening! Sadly I remeasured last night – 34″ waist. Too much birthday cake! 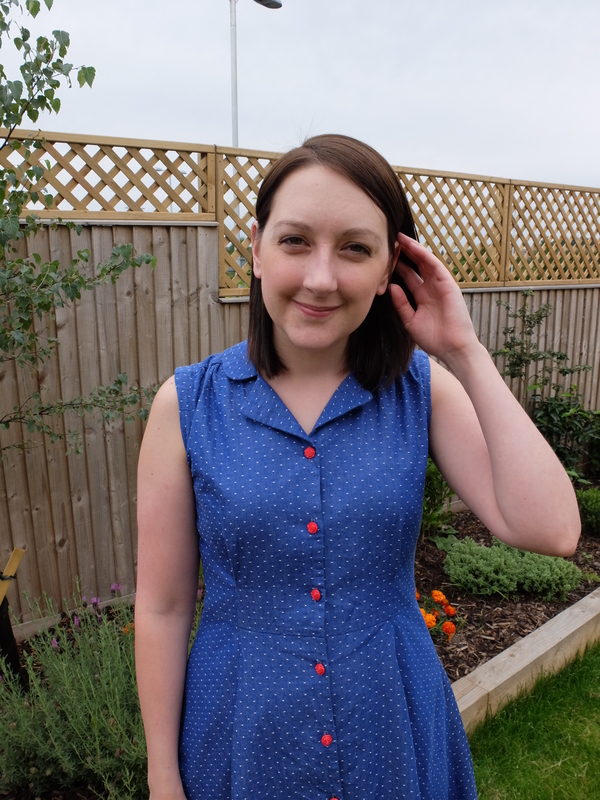 Lovely dress – I would say that because I love this pattern, and I was also forced to buy a second colourway of same chambray because I liked the first one I bought so much! 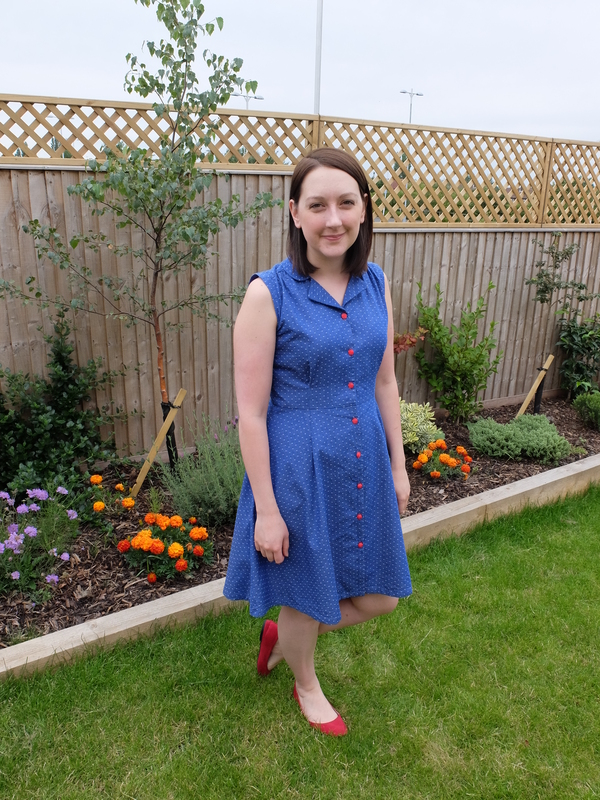 What you said about feeling like a 1950s matron made me laugh – my uncle told me I looked like a character from Call the Midwife when I was wearing my version of the dress! Love it. I always have a blogging backlog! I like having a little backlog so that I’ve got something to blog when I get time, but lately I have loads – including a jumper from last winter… The danger is that I won’t remember anything about the project when I finally blog it. Thank you! Glad to hear I’m not alone. That’s exactly my fear too. Need to write post it’s about them!! I have just now, with yours, cleared my whole blog roll!! Phew – it feels good to be caught up in the sewing world! 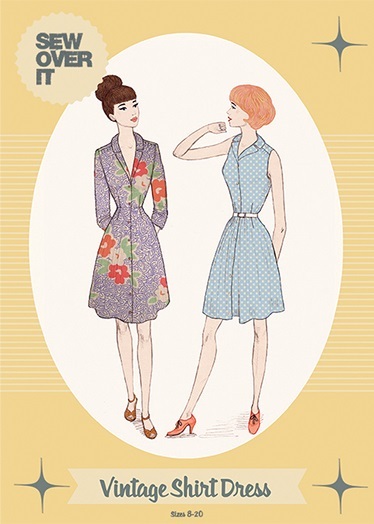 After seeing your dress I am totally going to have to buy this pattern – I love the chambray/red button combo, pertection! I think I’ll try to get the pattern when I’m in London, it’s so expensive over here! Hopefully we can catch up if you are around!! Hi lovely! I’m only just getting to this, I’ve been saving it as I really wanted to read what you had to say about this pattern. It’s kinda serendipitous really as I’ve just ordered some Robert Kaufman chambray with skulls on (looks like polkadots from a distance) and was wondering if it’d work with this pattern – and judging by your beautiful dress it definitely will! I love reading about what you’re up to but please don’t put any pressure on yourself! I’m quite happy catching up on Twitter and IG as that’s all I have time for too at the moment. The week of sewing sounds blissful and I guess it’s all blog food when you get a moment! Skulls!!! That sounds amazing. As long as you don’t mind the flare of the skirt turning your skulls a little slanted I think it’ll totally work. It was really nice to just get in the zone and chill out. Especially since we didn’t get a holiday this year, need to find other ways to relax!